After a hate crime occurs in his small Texas town, Adrian Piper must discover his own power, decide how to use it, and know where to draw the line in this “powerful debut” novel (Publishers Weekly, starred review) exquisitely illustrated by the author. In this thoughtful drama, a gay teen navigates the treacherous social landscape of his small-town Texas high school, confronting homophobia and his own reluctance to publicly embrace his identity. Adrian Piper lives for his art, especially his "secret superhero creation," Graphite, a Renaissance-art-inspired, outwardly gay character who has romanticized adventures with stylized versions of Adrian's best friends. In the real world, Adrian just wants to make it to graduation. After he stands up to bullies assaulting another gay student, Adrian discovers that he's no longer content to slip under the radar. As he attempts to fight injustice through art and quiet action, he finds his inner strength and realizes that things aren't as simple as they seem. 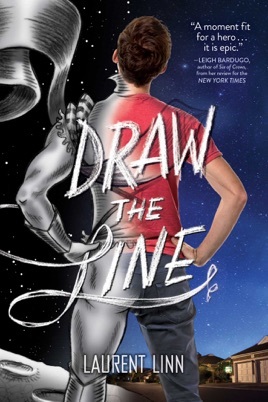 Linn, an art director at Simon & Schuster, makes a powerful debut with this empathic page-turner, for which he also supplies dramatic pencil illustrations that believably represent Adrian's Graphite comics. A diverse cast and an emotionally rich plot make this a gripping journey of self-discovery, romance, art making, and justice. Ages 12 up. This story is amazing beyond belief. It made me laugh and cry and at times giggled like a little school kid. This story perfectly melds my love of superheroes and my love of LGBT romance. I related to multiple characters on several levels and I loved how complex each character was. Even the characters with the smallest parts showed depth beyond what most books reveal about their main characters. An overall amazing read and I can't wait for a sequel!